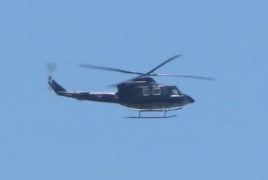 PanARMENIAN.Net - The recently received Bell-412 helicopters of the Azerbaijani Air Force (AzAF) will make their maiden public appearance in a fly-past at the country’s military parade in Baku on June 26, Defense Blog says. Bell-412 copters are produced by Bell Helicopter, an American aerospace manufacturer, and it is unclear how they reached Baku, given the U.S. embargo on weapons sale to Azerbaijan. In the fall of 1992, the U.S. Congress banned non-humanitarian economic aid and weapons sales to Azerbaijan by adopting Section 907 of the Freedom Support Act. According to the Azeri Defence, the helicopters will be showcased in a parade that will be organized for 'the 100th anniversary of Azerbaijan army'. The Bell 412 is a twin-engine utility helicopter, particularly popular in the oil industries, military and for law enforcement use. The vehicle is reportedly the first non-Soviet/Russian helicopter, which is demonstrated in parades. In addition to Bell-412, Mi-24, Mi-24G, Mi-35M attack helicopters, Mi-17 military transport and Ka-27 helicopters will fly in the parade.